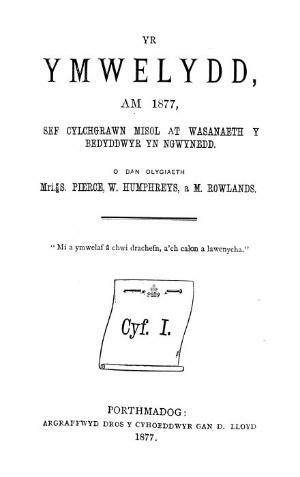 The Welsh language religious periodical of the Scottish Baptists of Gwynedd. The periodical's main contents were religious articles, poetry, music and denominational news. Originally a monthly publication it was published bimonthly from 1940 onwards. The periodical was edited by Samuel Price and William Humphreys (Elihu) until December 1882, by William Humphreys alone between 1883-1894 and 1905-1910, by William Humphreys and Cadwaladr Humphreys between 1895 and 1904, and by John Daniel Davies between 1911 and 1941.